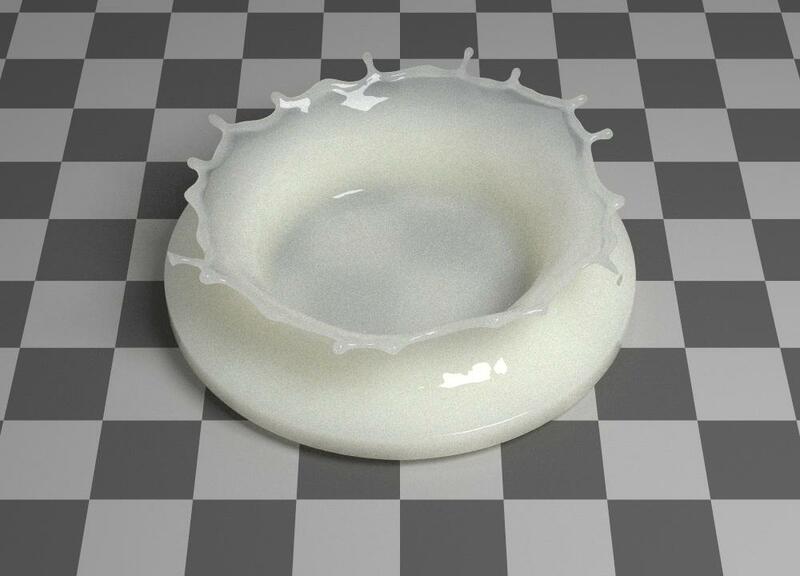 Skim milk splashing as shown in the SIGGRAPH presentation of "Topology Adaptive Interface Tracking Using the Deformable Simplicial Complex". Rendering by Anders Wang Kristensen based on parameters by Jeppe Revall Frisvad. The deformable simplicial complex (DSC) method is a recent, Lagrangian method for deformable interface tracking developed at the Department of Informatics and Mathematical Modelling, Technical University of Denmark. The method is quite general and has been implemented in both 2D and 3D. It has applied to 3D geometric flows, finding cut loci on Riemannian 2-manifolds, and to fluid simulation. Animations created with the DSC method can be found at Marek Misztal's Vimeo account. M. K. Misztal, J. A. Bærentzen. ACM Transactions on Graphics, Vol. 31, Issue 3, 2012. Presented at SIGGRAPH, Los Angeles, USA, 2012. M. K. Misztal. PhD thesis, 2010. M. K. Misztal, K. Erleben, A. Bargteil, J. Fursund, B. Bunch Christensen, J. A. Bærentzen, R. Bridson. In Proceedings of ACM SIGGRAPH/Eurographics Symposium on Computer Animation (SCA), Lausanne, Switzerland, 2012. K. Erleben, M. K. Misztal, J. A. Bærentzen. In Proceedings of ACM SIGGRAPH/Eurographics Symposium on Computer Animation (SCA), Vancouver, Canada, 2011. M. K. Misztal, R. Bridson, K. Erleben, J. A. Bærentzen, F. Anton. In Proceedings of the 7th Workshop on Virtual Reality Interaction and Physical Simulation (VRIPHYS), Copenhagen, Denmark, 2010. M. K. Misztal, J. A. Bærentzen, F. Anton, S. Markvorsen. In Proceedings of International Symposium on Voronoi Diagrams in Science and Engineering (ISVD), Qingdao, China, 2011.